The first challenge of the day was a power steering cooler that exploded on the first lap. Les and his co-driver Joe Thompson re-plumbed the car in the middle of the desert. When they got back going again, they had some ground to make up, but through consistency they were able to get back into the same 12th to 18th range of finishing order. On a more ongoing basis, they had vapor locking issues that challenged them at different points during the day. At the end of the last lap on a downhill rock trail called Resolution, when they were on the homestretch about to finish 18th, the car vapor locked. They couldn’t get the car flat enough to start and in order to finish it would become necessary for co-driver Joe Thompson to run 2 miles to Main Pit at the Start/Finish line for fuel to top it off and get it started. While Les sat on the hill he counted the cars pass until he was able to finish 36th. “We didn’t have a single flat on our Goodyear Tires, and the support from the Goodyear crew all week was exceptional,” said Figueroa. 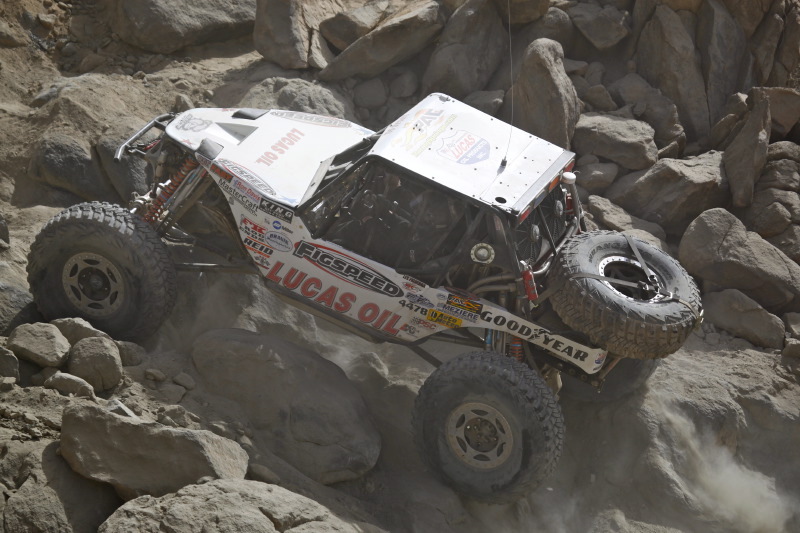 Figueroa has completed two of his three attempts at the King of the Hammers. New to rock sports racing, he has been competing in drag racing for 23 years. This weekend he will be attending the NHRA Nationals in Phoenix Arizona displaying on the midway for Lucas Oil and Comp Cams. About Figspeed: Figspeed is a performance retail store in Henderson, NV and a Manufactures racer support trailer / speed-shop-on-wheels that travels to NHRA National, Divisional, NMCA, SCTA – Bonneville Speed Week, PSCA and HDRA events to support all forms of motorsports for the top manufactures to the racers, with special focus on the grass root levels. Recognizing that many companies didn’t have the resources to attend all these events, Les Figueroa brought Auto Meter, Aeromotive, Comp Cams, Dedenbear, Fast, Race Shop Converters, Lucas Oil, Moroso, MSD, Painless Wiring, Quick Fuel, Race Pak, RHS, Ron Davis Racing Products, Strange Engineering, TCI and XRP in house and to the track. The onsite tech and support hosts not only products, but also Figueroa’s encyclopedia of knowledge, contacts and resources to help each racer perform better at every race. About Les Figueroa: Les Figueroa has been an avid drag racer for 23 years and has multi-NHRA National and Divisional wins and a Division Championship. As a long time offroad recreationalist, he recently started competing in the Ultra4 series. In 2010 they finished the car hours before the race but did not finish. Figueroa came back strong at the Stampede race qualifying for the 2011 King of the Hammers. 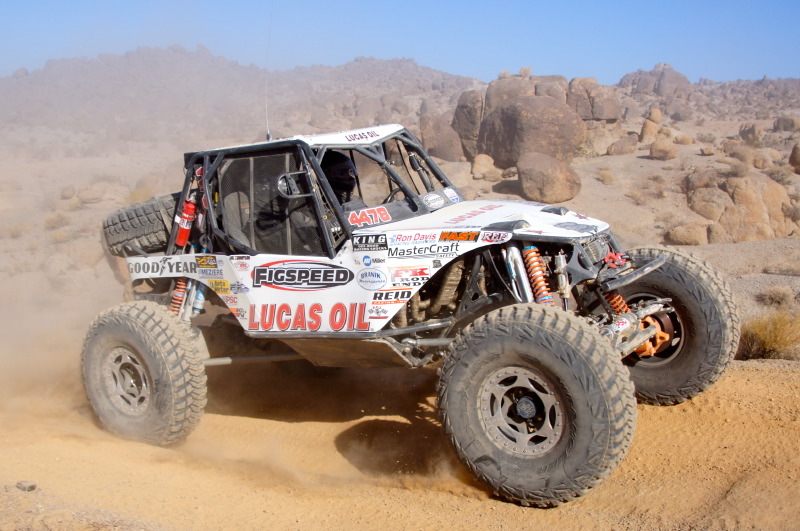 Figueroa finished the 2011 King of the Hammers in 9th place, pre-qualifying him for 2012 where he finished 36th. In 2012 he will be participating in select Ultra4 Races. Figspeed Partners: Figspeed, Lucas Oil, Goodyear Tire, Auto Meter, Aeromotive, Bulldog Winch, CompCams, FAST, FK RodEnds, GearWorks, MasterCraft Safety, Meziere, Pac Springs, Pacific Fabrication, Painless Wiring, PCI Race Radios, PSC, Reid Racing Inc., Ron Davis Racing Products.